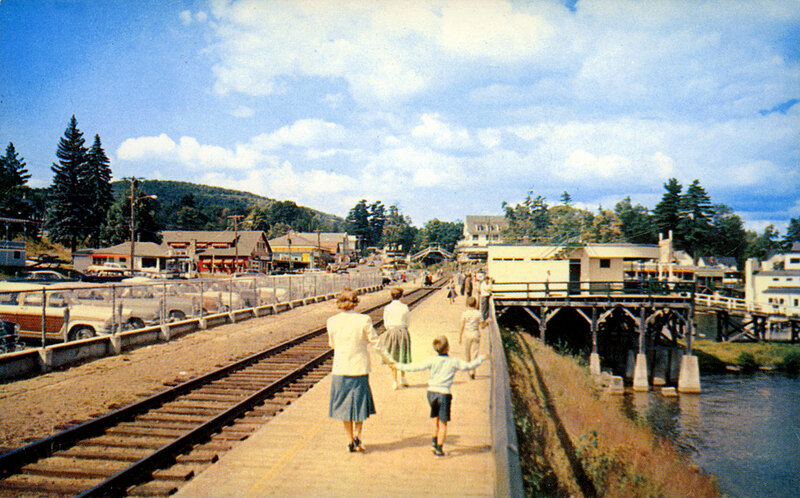 Below, strolling down the boardwalk around 1956. 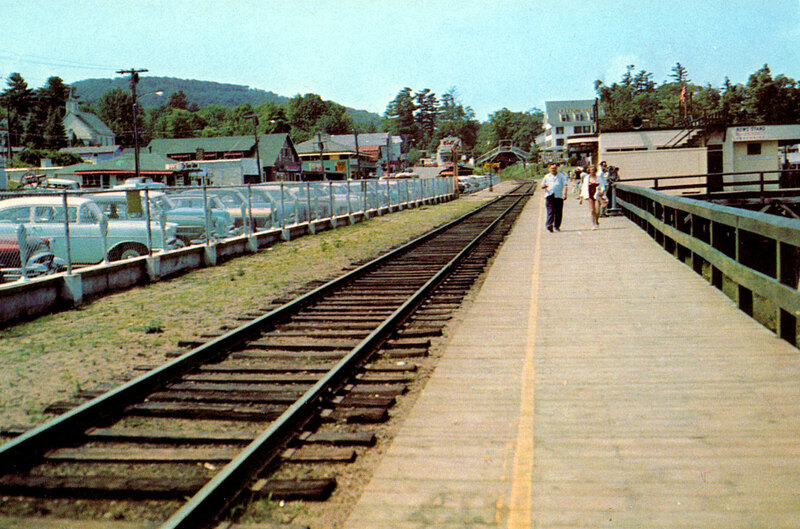 Comparing the two photos, one can see that in the above photo, the 1957 Half Moon Arcade building (now the Half Moon Bumper Cars) has been built in front of the Half Moon Restaurant, and the tall trees behind the Korner Kubbard have been cut down, revealing a view of the Methodist church from the boardwalk. 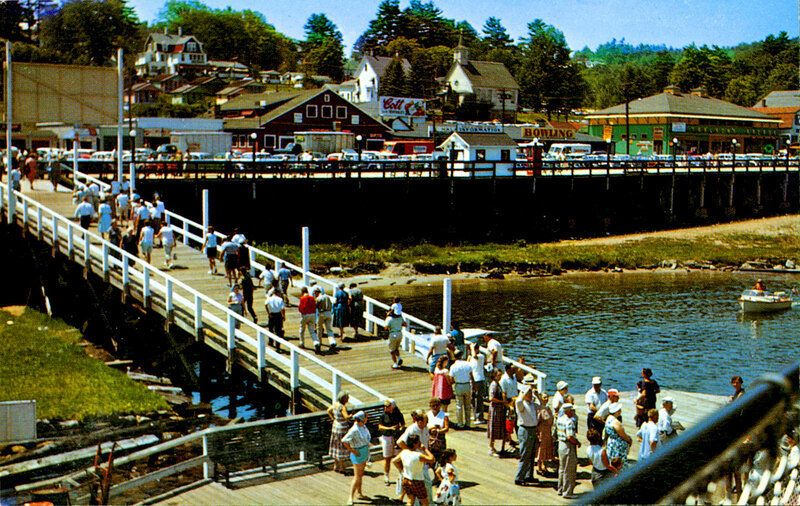 In this late 50’s photo, passengers are seen walking up the ramp from the Mount Washington wharf to the boardwalk. Note the large sign for Cott Beverages on the roof of the Half Moon in the above photo. The Cott Corporation began in the early 1950’s when Cott Black Cherry soda was served to the children of the founder of the company, Harrry Pencer, at a camp on Lake Winnipesaukee. Cott rapidly expanded in the 1950’s when it was based in Manchester, NH. The Cott Bottling Company, as it was known then, had bottling plants in Manchester; Natick and Somerville, Massachusetts; and Portland, Maine. Now, Cott is based in Tampa, Florida and in Toronto, Canada, and is a leading producer of private label beverages in the US and Canada. Cott is now a multinational corporation with nearly $2 billion in revenues and 3000 employees and operates in 60 countries. Quite a leap over the last fifty years from its Lake Winnipesaukee roots!